While FIC's original AU11 was a decent performer, it lacked some features that are almost necessary for today's computers. FIC has tried to address some of these issues with the new and improved AU13. First and most, the AU13 supports Serial ATA (and Serial ATA RAID) and with Serial ATA HDD's starting to gain popularity and momentum, it's nice to know that the AU13 natively supports them. Other goodies on board are 10/100 LAN, nVIDIA SoundStorm 5.1 audio and IEEE 1394. 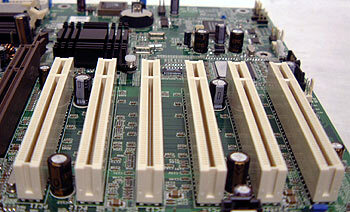 FIC knows that expansion is inevitable so they've also included six 32bit PCI slots for your expansion needs. As you have probably noticed FIC uses a rather large passive heatsink on the MCP-T Southbridge, this is welcomed since the MCP-T gets extremely hot during operation. The layout of the AU13 is very good, the main ATX, IDE/Floppy drive connectors are in a great location to the right of the DIMM slots. FIC has also done a good job at clearing the lower half of the AU13 of obstructions. You won't have any problems installing full length PCI devices with the AU13. Because most Serial ATA HDD's do not come with the required 15 pin Serial ATA power connector, we were happy to see that FIC include one with the AU13. Overclockers will certainly replace the stock black Northbridge heatsink almost immediately. Like with the AU11 there's a silk screen for a Port 80 diagnostics card but it's a shame that FIC decided not to go ahead and install one. Our particular test sample was not much of an overclocker but we're positive the puny Northbridge heatsink didn't help. 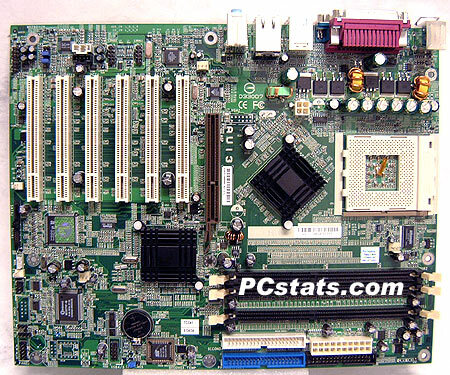 The AU13 is definitely not an overclockers motherboard of choice but for $115 CDN ($85 US) all can be forgiven.